There has been a lot of conversation in the podcasting world lately about podcasting outside of the studio. Mobile podcasting has become easier in recent years because of advances in smartphone/tablet computer technology. Professional podcaster, Ray Ortega's Podcasters' Roundtable devoted an entire episode to this topic and at NMX 2014, Rob Walch of popular media host, Libsyn, presented a talk about podcasting entirely with iOS devices. 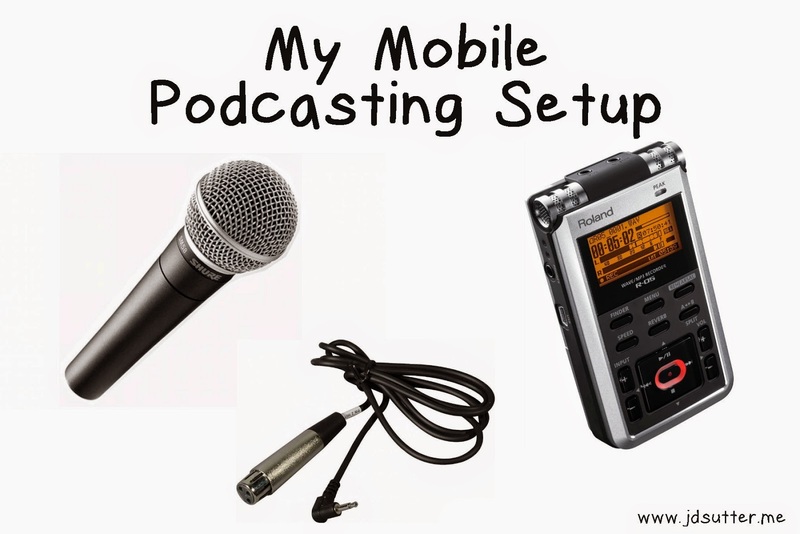 As with most other topics in podcasting, there are many approaches one can take to the mobile podcasting setup. When covering that live event for your show you could bring along your mixer, boom arms, mic, etc. or go the streamlined route and only use your smartphone. My personal approach is somewhere in the middle and it has worked well for me. Let me note that I am not recording an entire episode of my podcast on the site of an event. If I were doing that my gear might be a little different. What I've done is record interviews only that would then be used as the main content or a segment in an episode of the podcast. Lets go through each piece of gear that I have in my workflow, large and small, and we'll look at how they all work together to help make recording "on the go" a relatively pain-free experience. These items are the essential elements for my mobile podcasting workflow. I choose to go with the digital recorder over a smartphone or tablet for multiple reasons. Since the recorder is hardware, there's no worry that an app may crash. Another factor is that when at an event, I'd prefer to conserve the battery life of my phone. My microphone choice just comes down the the fact that the SM58 is a durable mic that can take a beating from travel and still keep on going and is little worse for the wear. It also does a really admirable job of reducing handling noise. The audio cable is pretty self-explanatory except to mention that I specifically choice the "L" shaped plug as it puts less strain on the recorder's input jack and is also a bit smaller and therefore allows me to slip the recorder into a pocket if needed. While not required, it is certainly helpful to be able to monitor your audio with earbuds as you record. Obviously any kind will do, but I like these because they wrap up in the case nicely for tangle-free packing. If I'm going to be sitting at a table to do an extended interview, the tripod (which attaches to the back of the R-05) is rather handy to hold the recorder up so I can monitor the display. I use my smartphone to access interview notes and questions that I've prepped ahead of time; my notes are stored in Google Drive. The over-the-shoulder bag that I picked up to hold all my equipment is an extremely valuable piece of gear. I can put everything in there and have my hands free for networking without having to carry around a large backpack. That is my mobile podcasting setup. As I said before, there are many different ways to record audio for your show when on the road. I'm not suggesting that my way is the best way, nor am I going to say that one method is superior to another. It really depends on your needs and the type of situation that you're in and I'd say that personal preference also plays a part in the gear choices. What does your mobile setup consist of? Have you tried various options?